Binoculars are the most used optical instruments in the world and each one has its own characteristics or even specific uses. You can never know too much about binoculars. The variety of models and technical specifications existent is so huge, that you can get lost easily. If you get lost in this world, or you know about it but want to learn more, keep on reading. This may interest you! Do you want to buy binoculars or read some comparatives between different models? 2. Types of binoculars: roof or porro, which one is for me? 4. Which activities are binoculars used for? 6. Range of prices. How much am I going to sp﻿end? Basically the optic structure of binoculars is integrated by three main elements: the objective lens, a bunch of prisms and ocular lenses. As you can see in the image, this optic instrument is formed by several elements that work together: The light enters into both objective lenses and goes through the prisms, which reflect and revert the image so that we can see it right. Through the ocular lenses we can finally see the image that we get when we look through the bins. To make the visualization through the binoculars more comfortable, most of these have protector rubbers. These ones are essential for people that don’t use glasses. Glasses users don’t need them, so they can just pull the rubbers down and hide them. Also, as you can’t normally see with the same sharpness in both eyes, there is a diopter ring, plus a focus knob to help you reach the perfect sharpness. Binoculars can have two different types of body construction: porro or roof. → Porro binoculars use a non-line optic system, as you can see in the picture. They are bigger than the roof type and therefor, heavier. The configuration of their prisms is quite peculiar: the optic axis of the objective lens is displaced from the ocular axis (the part of the binoculars where we look through). That’s why this type is much more wider. → Roof binoculars are light and straight, and have a more complex intern structure. They are very easy to identify: their objective lenses, prisms and ocular lenses are disposed within the binocular tube linearly. When buying a pair of binoculars, the first election should be: porro or roof? The way they are build, condition characteristics such as physical appearance, weight, volume and optical performance. Porro binoculars generally offer a better sense of depth, and can distinguish easier between the focused object and the surrounding background. Furthermore, the construction of this type of bins is simpler and easier to manufacture, so they are usually less expensive than the roof ones. Still, roof binoculars are smaller, more compact and lighter. And weight is a key factor. That is because you normally walk long distances in nature with your bins over your neck. 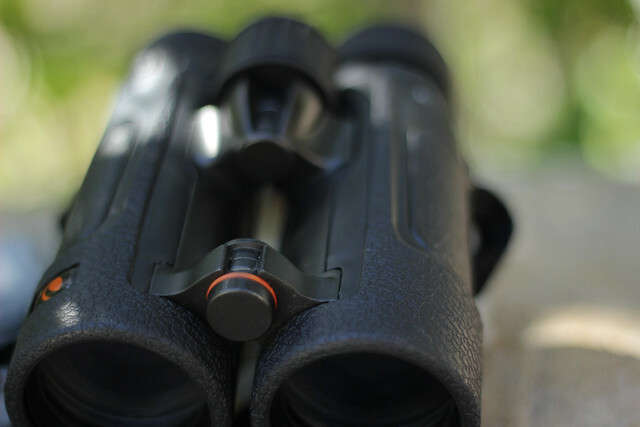 For activities such as birdwatching or hiking, roof binoculars are certainly ideal. 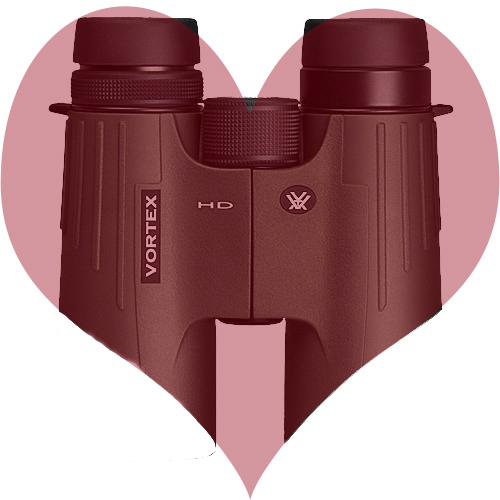 As for the quality of the optical elements (something essential when choosing binoculars), the optical drawbacks of the roof ones are avoided by multiple coatings of the lenses, so that differences in image quality between one kind or another are barely perceptible. And just because the roof ones are more ergonomic, versatile, light weighted and compact designed, they are the most used nowadays. 3. Technical characteristics of binoculars: which features do I have to look for? Two of the most interesting features of binoculars are the magnification power and the diameter of the lenses. On one hand, the magnification power is the grade of zoom of the object that is been observed. For example, a binocular of 10x42 means that an object will appear 10 times closer than with the naked eye. So, if we are looking at something that is 100 meters away, we can see it like if it is only 10 meters far. On the other hand the lens diameter shows the diameter in millimeters of the objectives. Knowing this, in binoculars of 8x42, the number 42 corresponds to the opening in millimeters, so this binocular has 42 mm of diameter. This parameter determines the light gathering capability of binoculars, so the larger the diameter, the brighter they will be, but also heavier (don’t forget that). 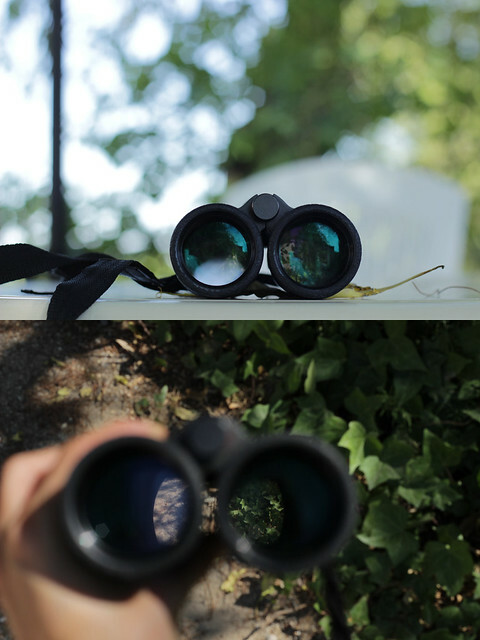 Although one might think that the more magnification power, the better the binoculars are (because you will see the object much more closely), in real life it is not like that. The more zoom, the more vibrations when looking through them, and by extension, greater distortion of the image, having to use tripods for their proper use. Also, it means losing angle of view and making it very difficult when locating moving animals. This characteristic indicates how bright the image will be in low-light situations. Higher numbers means brighter images. To calculate the exit pupil you have to divide the diameter of the objective lens by the number of magnification. For example, the exit pupil of a pair of 7x42 is 6 mm. Luminosity is the capacity of gathering and transferring the necessarily light to get a defined and bright image. The luminosity depends on several factors like the diameter of the objective lens, the magnification power, the quality of the lenses or the optic coatings of these. Generally, lenses with greater diameter, a low number of zoom and good coatings, are brighter. The field of view is the visible area through the binoculars. It is usually expressed by referring to the area visible at 1,000 yards (915m), or degrees of vision. Simplifying terms: the wider the viewing angle, the larger the area that can be seen through binoculars. This parameter is also related to the magnification power, so the higher the magnification, lesser the field of view will be. ○ Prisms: ¿BAK-4 or BK-7? What?! As for the building material of the prisms, we can find the BK7 (boro-silicate) and BAK-4 (barium glass). The last one produces sharp images of much higher quality. The BK-7 prisms are certainly are cheaper but less efficient in transmitting light and avoiding chromatic aberrations. Another important aspect to consider is the distance of the eye relief. This is the distance that must exist between our eyes and the eyepieces so we can observe all the illuminated visual field through them. The greater this distance, the more comfortable we will be looking through binoculars. Overall, comfortable vision results from 1 centimeter on. A lower number could cause eyestrain. It is a particularly important factor for observers with glasses, in which case the distance of accommodation should be about 1.5 centimeters. The mount of the binoculars determine its resistance to environmental factors such as rain or dust. Binoculars are usually coated with a rubber that protects from bumps and makes the grip easier. Something important to know about water resistance, is that there is a distinction between 'water resistant', which resist splashing, and 'water proof' that resist handling in the rain and can be submersible. This parameter refers to the degree of differentiation between the object and the background image. High contrast helps to discern subtle details. Keep in mind that the better the resolution of the lens, the greater the contrast. So, optical high quality treatments offer high contrast in the observed images. The resolution measures the ability of binoculars to distinguish fine details and to transmit sharper images. This measure is related directly with the diameter of the objective. Generally, lenses with larger diameters offer more details to the observer than the smaller ones. Although, the resolution is also related to the quality of the optical elements, the coatings of its lenses and the visual acuity of the user. Collimation refers to the alignment of the optical and mechanical elements of the binoculars. This parameter prevents the double image feeling, while improving image resolution and avoids eyestrain and headaches. All binoculars have a mechanism to achieve the optimal approach of objects that are at different distances. Most of them have a center focus knob, which moves the two eyepiece tubes to get a clear view. Moreover, as the vision of each eye is normally slightly different, the binoculars feature a separate focus or diopter corrector. This allows you to focus individually one of the eyes to correct the visual decompensation. The various optical elements of the binoculars (over 10 different surfaces) have a post treatment to reduce optical aberrations. This consists in antireflective coatings layers which prevent the loss of light by reflection of the lens and chromatic aberrations. This way, sharper, brighter and reflection-free images are achieved, allowing more light to reach the eye of the watcher. Coated: partial treatment, so one or more surfaces are treated, having a poor overall quality. Fully Coated: All surfaces are treated with a magnesium fluoride anti-reflective layer. The capacity of transmission of light is approximately 80%, quite acceptable for most users. Multi-Coated: One or more surfaces are treated with multi-layers of a chemical compound and the rest with magnesium fluoride. Fully Multi-Coated: All optical surfaces are treated with multiple layers of a chemical compound. Binoculars that offer this treatment include a transmission of 90 to 95%. The result is an incredibly bright image with máximum contrast. In top quality binoculars, lenses are made of low dispersion or fluorite glasses, which reduce even more chromatic aberrations. Binoculars can be used for different types of outdoor activities. According to the uses that you will give them, you'll need specific features. 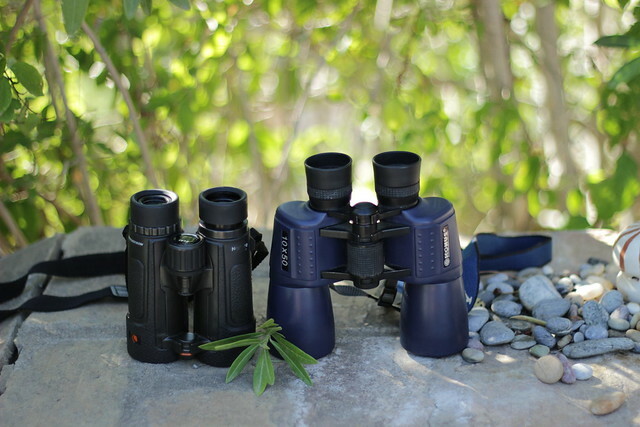 If you enjoy wildlife and you are passionate about birds, binoculars will become a must tool. That is because one of the most common uses of binoculars is birdwatching. The standard binoculars for this activity are 8x42 and 10x42 generally. But the range of zoom can be between 7 and 12, combined with 40 to 50mm. Binoculars, beside the usual telescopes, are also a key tool for observing the night sky. You can quickly locate stars and planets with them. Binoculars for astronomical uses are designed with long distance lenses and a great objective diameter, which facilitate and increase the light entrance and gathering. More entrance of light means easier observation of stars. The most used are the 7x50, 10x50, 15X70, 20X50 o 20X80, being the 10X50 the most efficient of all. For theater, opera and musical concerts the ideal ones are very bright, so you can increase the light when sitting in the dark. The 4x30 are a great choice. It is also possible to find binoculars that may adapt to all kinds of activities, like hiking, sports, traveling or other outdoor exercises. The range of magnification power should be between 7 and 12. But don’t forget the necessity of a light weight. These ones allow to see practically almost in complete darkness. They are normally used for military activities and hunting. 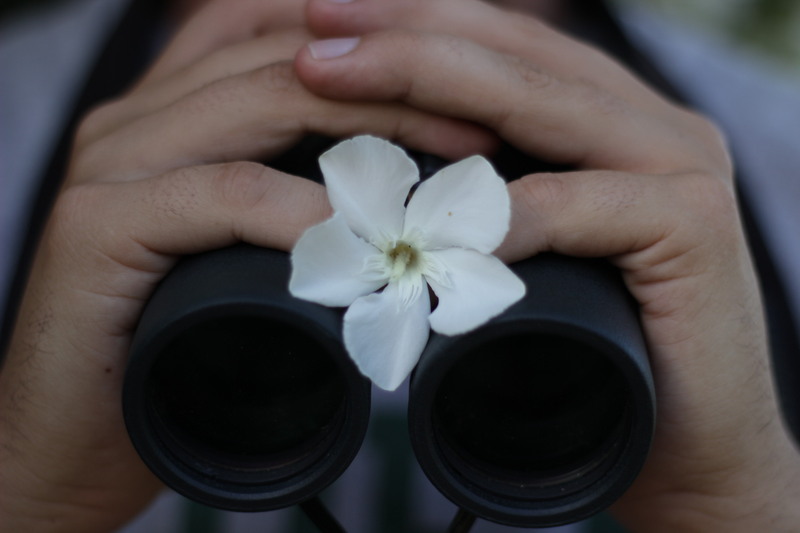 While hiking trails through the countryside you can find all kinds of animals and beautiful landscapes that can be seen through binoculars. For this activity undoubtedly the most essential thing is lightness (7x35, 8x42, 8x25, 10x25...). When we are aboard of a ship, it is essential that the binoculars are completely waterproof on the outside. For marine activities it is not recommended long distance magnification, since the movement of the ship would unstable the image every second, transmitting vibrations and distorting the view. 7x42 or 7x50's are ideal for this activity. There are a lot of brands that are selling binoculars, in addition to other optics instruments, like spotting scopes or digiscoping accessories. 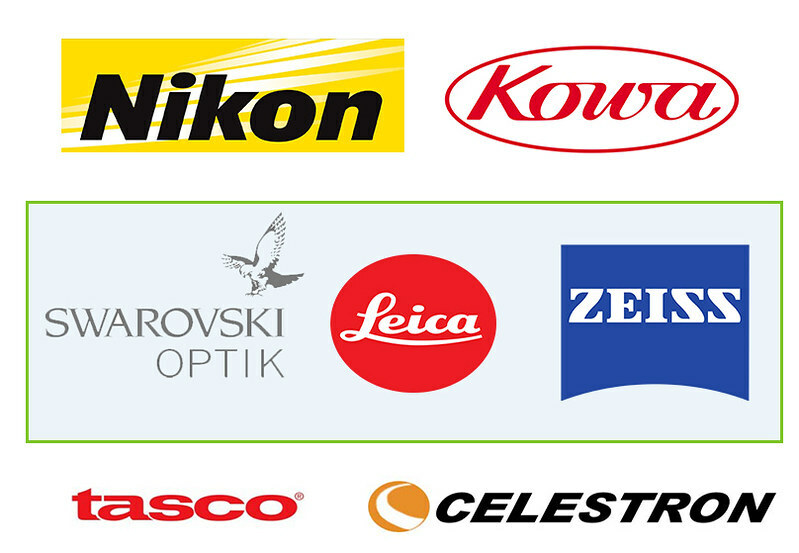 Brands like Swarovski, Leica, Kite, Minolta, Nikon, Pentax, Kowa, Steiner and Zeiss have years of reputation for providing high quality products. 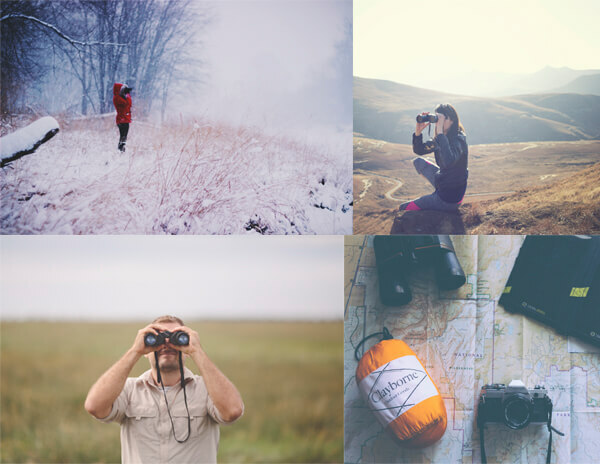 Tasco, Jason, Celestron, Delta and Bushnell are examples of brands that have specialized in offering products at a lower price. 6. Range of prices. How much am I going to spend? The price of a pair of binoculars can vary greatly, depending on its specific features and the brand. The range of prices, from one extreme to another, can be from 50$ to 2.000$. Obviously it all depends on what your needs are and what you expect from them. Binoculars of 900$ have features that 80$ ones will not give you. Optical quality is expensive, thus creating lenses that prevent ocular aberrations and the materials used for its construction are not even close to cheap. If you are going to make a regular use of the binoculars, it would be recommendable not to buy a pair that cost less than a 100$. You can actually get good binoculars at a quite reasonable price of 250$, like the Nikon Monarch binoculars or the Vortex ones. But don’t forget that the most expensive ones, like the Swarovski, Leica or Zeiss offer spectacular optical quality, that are often worth paying for.